10 A None No Power Seat 10 A is a standard Business Class seat that has extra legroom due to the exit in front. 10 B None No Power Seat 10 B is a standard Business Class seat that has extra legroom due to the exit in front. 10 J None No Power Seat 10 J is a standard Business Class seat that has extra legroom due to the exit in front. 10 K None No Power Seat 10 K is a standard Business Class seat that has extra legroom due to the exit in front. 12 A None No Power Seat 12 A is a standard Business Class seat however, the proximity to the lavatory and stairs may be bothersome. 12 B None No Power Seat 12 B is a standard Business Class seat however, the proximity to the lavatory and stairs may be bothersome. 12 J None No Power Seat 12 J is a standard Business Class seat however, the proximity to the lavatory and stairs may be bothersome. 12 K None No Power Seat 12 K is a standard Business Class seat however, the proximity to the lavatory and stairs may be bothersome. 20 A None No Power Seat 20 A is a standard Business Class seat that has extra legroom however, the proximity to the lavatories and galley may be bothersome. 20 B None No Power Seat 20 B is a standard Business Class seat that has extra legroom however, the proximity to the lavatories and galley may be bothersome. 20 C None No Power Seat 20 C is a standard Business Class seat that has extra legroom however, the proximity to the lavatories and galley may be bothersome. 20 D None No Power Seat 20 D is a standard Business Class seat that has extra legroom however, the proximity to the lavatories and galley may be bothersome. 20 E None No Power Seat 20 E is a standard Business Class seat that has extra legroom however, the proximity to the lavatories and galley may be bothersome. 20 J None No Power Seat 20 J is a standard Business Class seat that has extra legroom however, the proximity to the lavatories and galley may be bothersome. 20 K None No Power Seat 20 K is a standard Business Class seat that has extra legroom however, the proximity to the lavatories and galley may be bothersome. 22 B None No Power Seat 22 B is a standard Business Class seat however, the proximity to the lavatories may be bothersome. 22 J None No Power Seat 22 J is a standard Business Class seat however, the proximity to the lavatories may be bothersome. 27 A None No Power Seat 27 A is a standard Economy Class seat that has extra legroom however, the proximity to the galley and stairs may be bothersome. 27 B None No Power Seat 27 B is a standard Economy Class seat that has extra legroom however, the proximity to the galley and stairs may be bothersome. 28 B None No Power Seat 28 B is a standard Economy Class seat however, the proximity to the galley and stairs may be bothersome. 29 B None No Power Seat 29 B is a standard Economy Class seat however, the proximity to the galley and stairs may be bothersome. 30 C None No Power Seat 30 C is a standard Economy Class seat that has extra legroom however, the proximity to the galley may be bothersome. 30 D None No Power Seat 30 D is a standard Economy Class seat that has restricted legroom. The proximity to the galleys may be bothersome. 30 E None No Power Seat 30 E is a standard Economy Class seat that has restricted legroom. The proximity to the galleys may be bothersome. 30 F None No Power Seat 30 F is a standard Economy Class seat that has restricted legroom. The proximity to the galleys may be bothersome. 30 G None No Power Seat 30 G is a standard Economy Class seat that has restricted legroom. The proximity to the galleys may be bothersome. 30 H None No Power Seat 30 H is a standard Economy Class seat that has restricted legroom. The proximity to the galleys may be bothersome. 30 J None No Power Seat 30 J is a standard Economy Class seat that has restricted legroom. The proximity to the galleys may be bothersome. 30 K None No Power Seat 30 K is a standard Economy Class seat that has restricted legroom. The proximity to the galleys may be bothersome. 37 A None No Power Seat 37 A is a standard Economy Class seat that may have limited recline. The proximity to the lavatories may be bothersome. 37 B None No Power Seat 37 B is a standard Economy Class seat that may have limited recline. The proximity to the lavatories may be bothersome. 37 C None No Power Seat 37 C is a standard Economy Class seat that may have limited recline. The proximity to the lavatories may be bothersome. 37 F None No Power Seat 37 F is a standard Economy Class seat that may have limited recline. The proximity to the lavatories may be bothersome. 37 H None No Power Seat 37 H is a standard Economy Class seat that may have limited recline. The proximity to the lavatories may be bothersome. 37 J None No Power Seat 37 J is a standard Economy Class seat that may have limited recline. The proximity to the lavatories may be bothersome. 37 K None No Power Seat 37 K is a standard Economy Class seat that may have limited recline. The proximity to the lavatories may be bothersome. 38 A None No Power Seat 38 A is a standard Economy Class seat that has slightly restricted legroom due to the protrusion of the exit door. The proximity to the lavatories may be bothersome. 38 B None No Power Seat 38 B is a standard Economy Class seat that has extra legroom due to the exit in front. The proximity to the lavatories may be bothersome. 38 C None No Power Seat 38 C is a standard Economy Class seat that has extra legroom due to the exit in front. The proximity to the lavatories may be bothersome. 38 H None No Power Seat 38 H is a standard Economy Class seat that has extra legroom due to the exit in front. The proximity to the lavatories may be bothersome. 38 J None No Power Seat 38 J is a standard Economy Class seat that has extra legroom due to the exit in front. The proximity to the lavatories may be bothersome. 38 K None No Power Seat 38 K is a standard Economy Class seat that has slightly restricted legroom due to the protrusion of the exit door. The proximity to the lavatories may be bothersome. 40 D None No Power Seat 40 D is a standard Economy Class seat that has slightly restricted legroom. 40 E None No Power Seat 40 E is a standard Economy Class seat that has slightly restricted legroom. 40 F None No Power Seat 40 F is a standard Economy Class seat that has slightly restricted legroom. 40 G None No Power Seat 40 G is a standard Economy Class seat that has slightly restricted legroom. 46 C None No Power Seat 46 C is a standard Economy Class seat however, the proximity to the galley may be bothersome. 46 D None No Power Seat 46 D is a standard Economy Class seat that may have limited recline. The proximity to the galley may be bothersome. 46 E None No Power Seat 46 E is a standard Economy Class seat that may have limited recline. The proximity to the galley may be bothersome. 46 F None No Power Seat 46 F is a standard Economy Class seat that may have limited recline. The proximity to the galley may be bothersome. 46 G None No Power Seat 46 G is a standard Economy Class seat that may have limited recline. The proximity to the galley may be bothersome. 46 H None No Power Seat 46 H is a standard Economy Class seat however, the proximity to the galley may be bothersome. 47 A None No Power Seat 47 A is a standard Economy Class seat that may have limited recline. The proximity to the galley may be bothersome. 47 B None No Power Seat 47 B is a standard Economy Class seat that may have limited recline. The proximity to the galley may be bothersome. 47 C None No Power Seat 47 C is a standard Economy Class seat that may have limited recline. The proximity to the galley may be bothersome. 47 H None No Power Seat 47 H is a standard Economy Class seat that may have limited recline. The proximity to the galley may be bothersome. 47 J None No Power Seat 47 J is a standard Economy Class seat that may have limited recline. The proximity to the galley may be bothersome. 47 K None No Power Seat 47 K is a standard Economy Class seat that may have limited recline. The proximity to the galley may be bothersome. 48 A None No Power Seat 48 A is a standard Economy Class seat that has extra legroom however, the proximity to the galleys may be bothersome. 48 B None No Power Seat 48 B is a standard Economy Class seat that has extra legroom however, the proximity to the galleys may be bothersome. 48 J None No Power Seat 48 J is a standard Economy Class seat that has extra legroom however, the proximity to the galleys may be bothersome. 48 K None No Power Seat 48 K is a standard Economy Class seat that has extra legroom however, the proximity to the galleys may be bothersome. 49 B None No Power Seat 49 B is a standard Economy Class seat however, the proximity to the galleys may be bothersome. 50 J None No Power Seat 50 J is a standard Economy Class seat however, the proximity to the galleys may be bothersome. 51 C None No Power Seat 51 C is a standard Economy Class seat that has extra legroom however, the proximity to the galley may be bothersome. 51 H None No Power Seat 51 H is a standard Economy Class seat that has extra legroom however, the proximity to the galley may be bothersome. 52 D None No Power Seat 52 D is a standard Economy Class seat that has slightly restricted legroom. 52 E None No Power Seat 52 E is a standard Economy Class seat that has slightly restricted legroom. 52 F None No Power Seat 52 F is a standard Economy Class seat that has slightly restricted legroom. 52 G None No Power Seat 52 G is a standard Economy Class seat that has slightly restricted legroom. 62 A None No Power Seat 62 A is a standard Economy Class seat that has limited recline. The proximity to the lavatories may be bothersome. 62 B None No Power Seat 62 B is a standard Economy Class seat that has limited recline. The proximity to the lavatories may be bothersome. 62 J None No Power Seat 62 J is a standard Economy Class seat that has limited recline. The proximity to the lavatories may be bothersome. 62 K None No Power Seat 62 K is a standard Economy Class seat that has limited recline. The proximity to the lavatories may be bothersome. 63 D None No Power Seat 63 D is a standard Economy Class seat however, the proximity to the lavatories may be bothersome. 63 G None No Power Seat 63 G is a standard Economy Class seat however, the proximity to the lavatories may be bothersome. 64 D None No Power Seat 64 D is a standard Economy Class seat that has limited recline. The proximity to the lavatories may be bothersome. 64 E None No Power Seat 64 E is a standard Economy Class seat that has limited recline. The proximity to the lavatories may be bothersome. 64 F None No Power Seat 64 F is a standard Economy Class seat that has limited recline. The proximity to the lavatories may be bothersome. 64 G None No Power Seat 64 G is a standard Economy Class seat that has limited recline. The proximity to the lavatories may be bothersome. Each First class seat has a regular 110V AC power port. Power in Business and Economy is available on select aircraft. 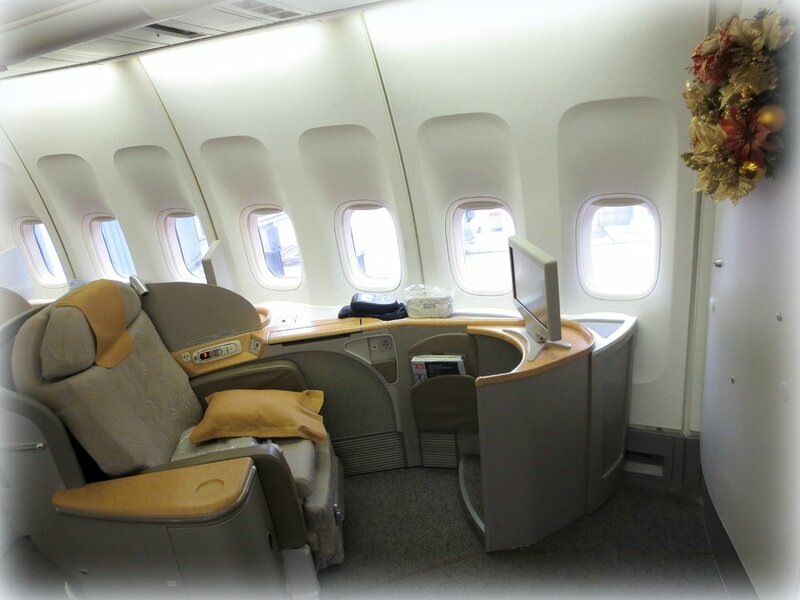 This version of Asiana's 747-400 is outfit in a three cabin configuration with First Class, Business class, and Travel class seating, totaling a capacity of 359 passengers. The 747-400 is optimized for mid-to-long haul routes. Seoul-Shanghai in business on upper deck. Cabin on this18-year old aircraft in desperate need of an update. It's worn and torn everywhere you look. Seat and entertainment system totally outdated. Cabin crew ran out of Cola within 5 minutes. Had booked business class because the aircraft was supposed to be their new A380. 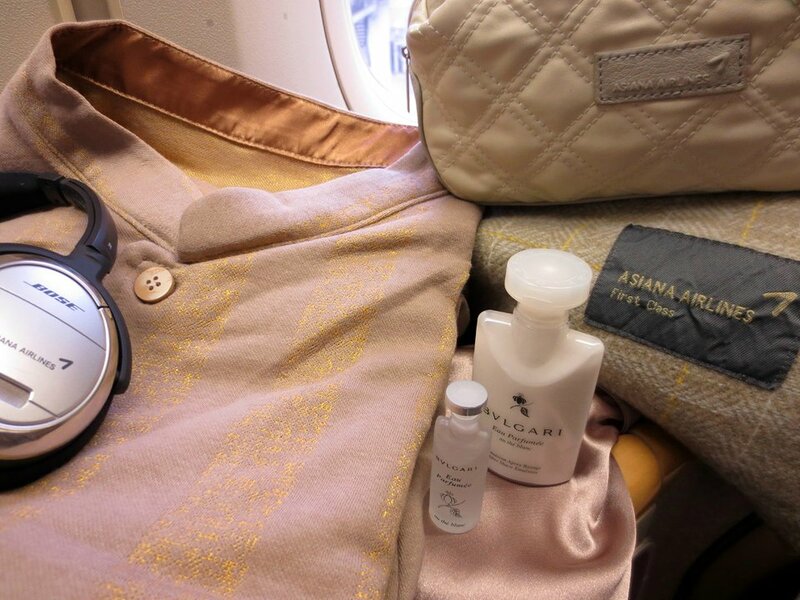 Asiana arbitrarily switched to an ancient 747 with absolutely miserable business class, seats as well as service. One of the worst business class experiences we encountered in years. All window seats in the upper deck have storage bins between window and seat. you can fit your carry on, shoes, books etc in. All your belongings are with you and in reach. A clear advantage of the window seat. I seat the economy class. Everyone think that economy class isn't comfortable. But Asiana was different. The service was great, and seat was comfortable, too. 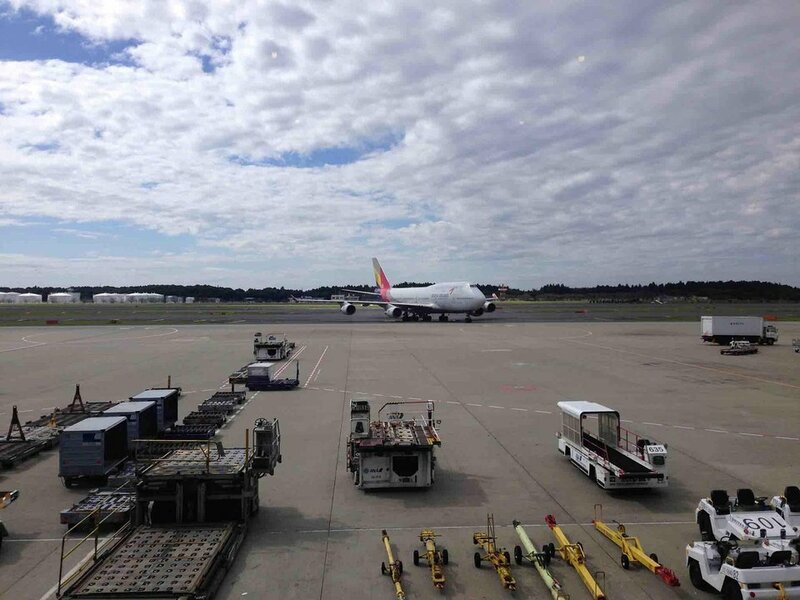 If I can ride the airplane, I want to meet Asiana again. the service is great and seat is full flat seat. It was great. And I can have a comfortable travel. Seat very discomfortable when flat with and do not offer much comfort when flat. Navigation on the (very) old entertainment system appears to be a reminisce from younger stone age. Screen appears to be from the late 90's and overall impression of cabin is WORN. Seats are comfortable when you first sit down but there is a bar in the mid-back that gets uncomfortable during a 10-12 hour flight. 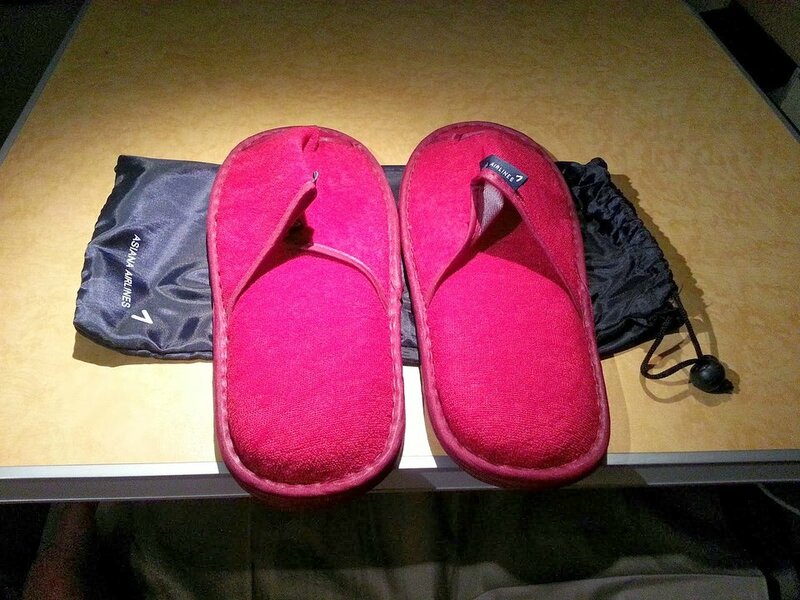 A small pillow provided by Asiana helps here. The video monitor image is washed out even when the cabin is dark. 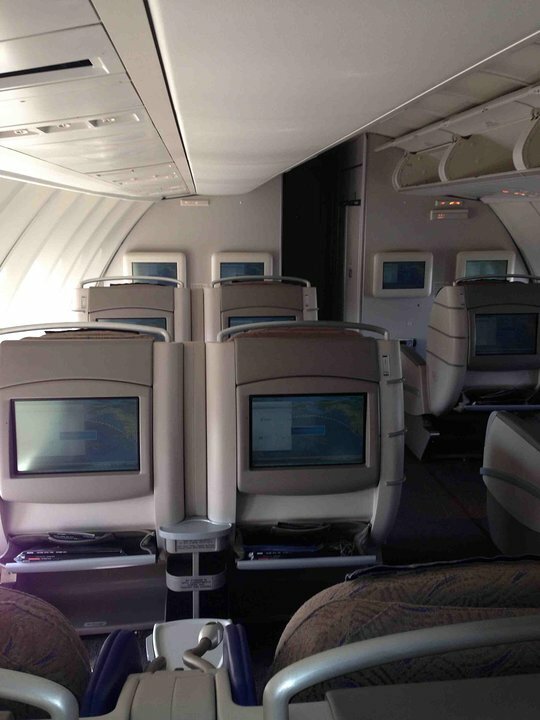 Asiana flies 1 versions of Boeing 747-400.